Oof. Sometimes brands manage to stick the landing with viral marketing, and sometimes they just…don’t. 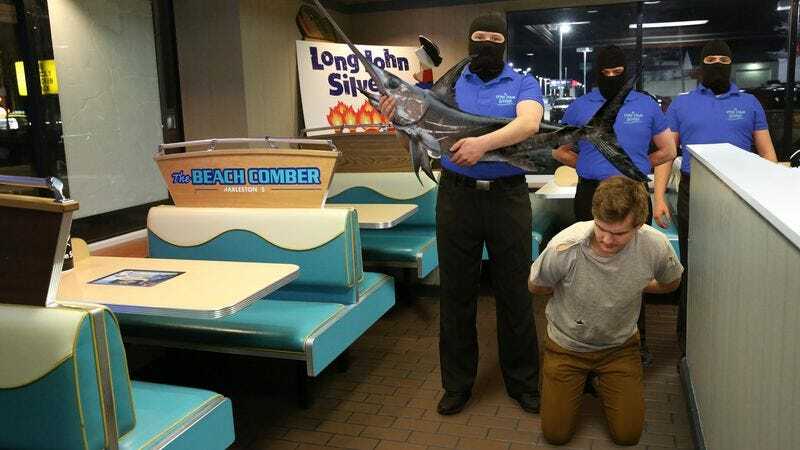 Long John Silver’s just found that out the hard way after facing major backlash over attempting to go viral with a video of a hostage being beheaded with a swordfish. If that isn’t a complete social media fail, we don’t know what is. Just over a minute and a half long, the video features a disheveled-looking man kneeling in an undisclosed Long John Silver’s location, his wrists bound with a zip-tie. He reads haltingly from a prepared statement, begging viewers to try the new Long John Silver’s $5 spicy shrimp-and-chicken combo basket, before a masked man steps forward, raises a swordfish, and severs the hostage’s head from his body with six swings. The swordfish seems to be alive but heavily sedated. Um, show of hands: Who’s surprised that everybody online hated this? Even though Long John Silver’s pulled the video from their social media channels within 24 hours, it had racked up millions of views by the time they did, along with an absolute tidal wave of backlash. Commenters shouted their horror and outrage over the video’s grisly content, and berated Long John Silver’s for pushing a NSFW video into their feeds. Tweeters also flooded Long John Silver’s promotional hashtag #CuttingEdgeFlavor with criticism, memes, and snarky one-liners, completely derailing the brand’s attempts to capitalize on the attention their beheading-with-a-swordfish video was garnering. Yeah, who thought this was a good idea? Some intern is definitely getting fired over this one. Of course, the damage to their brand had already been done. It just goes to show what happens when corporations try to force a viral hit. Other brands, be warned: Learn from Long John Silver’s majorly cringeworthy gaffe or pay the price!